Government of India runs a portal on National Scholarship for information on various scholarships offered for Indian Students. The list of National Scholarships and their notifications are listed below. Many Scholarships are sponsored by the Ministry Of Social justice and empowerment and also by the ministry of Minority affairs. The objective of the Government Is to provide financial assistance to the underprivileged so that they can complete their education. Many of these Scholarships are being sponsored by the central government and implemented by respective State governments. National Talent Search Exam, National scholarship test, Begum Hazrat Mahal National scholarship are conducted for granting the scholarships to students. 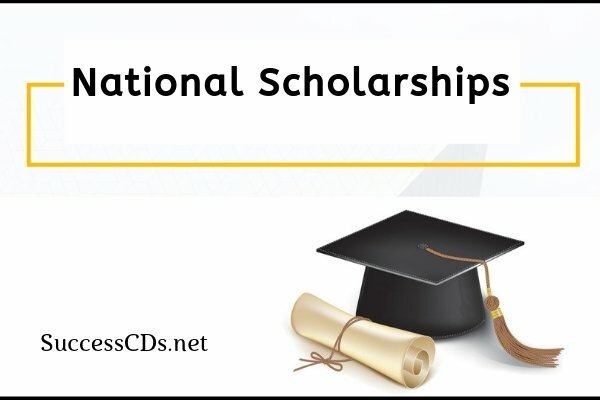 Check out the Notifications and dates of National Scholarship 2019 2020. Begum Hazrat Mahal National Scholarship 2018 - The 'Begum Hazrat Mahal National Scholarship' for girl students belonging to the minority communities was earlier known as 'Maulana Azad National Scholarship'. Bighelp National Merit Scholarship 2018 - Bighelp National Merit Scholarship helps poor, but meritorious students who have studied in Govt. Public Schools to continue a higher education after 10th grade. National Fellowship for Person with Disability 2018 - University Grants Commission invites application for the award of 200 Fellowships for Person with Disability.